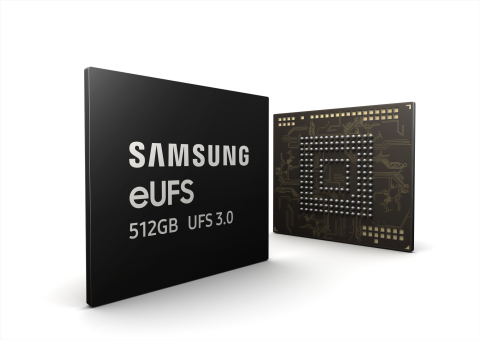 SEOUL, South Korea--(BUSINESS WIRE)--Samsung Electronics Co., Ltd., the world leader in advanced memory technology, today announced that it has begun mass producing the industry’s first 512-gigabyte (GB) embedded Universal Flash Storage (eUFS) 3.0 for next-generation mobile devices. In line with the latest eUFS 3.0 specification, the new Samsung memory delivers twice the speed of the previous eUFS storage (eUFS 2.1), allowing mobile memory to support seamless user experiences in future smartphones with ultra-large high-resolution screens. * Editor’s note: The calculation is based on transferring a 3.7GB full HD movie file from a mobile device with the 512GB eUFS 3.0 to a PC with a non-volatile memory express (NVMe) interface SSD.